Forget about dogs – clever storage ideas are man (or woman's) best friends, particularly for those fond of letting loose in the kitchen. So put Fido to one side, forget about cluttered work surfaces and start imagining how different it will be with these nifty solutions. While square rooms might be handy for builders, they're a notorious source of wasted space in kitchens. One way to make the most of those tight spots is to fit double-hinged doors and turn the entire corner into an integrated unit. 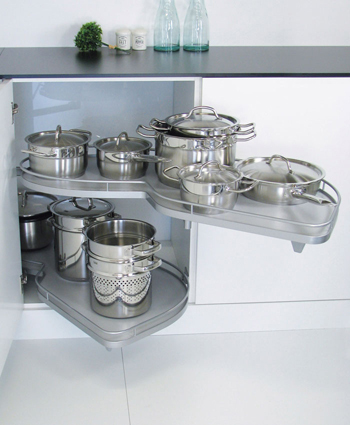 These clever storage solutions http://www.sncollection.co.uk mean that every inch of the recess can be accessed – and the expansive area create by combining the space of two unit is perfect for storing those awkward long-handled griddles and deep-curve woks. The traditional focus of kitchen storage units has been the walls, but islands and trolleys are a great way to combine practical solutions with statement design. As well as creating extra storage, both can be used to extend your work surface. Large pots and serving dishes can disappear beneath the top of an island, while moveable trolleys become a chef's best friend by allowing you to take your essential utensils to whichever part of the kitchen they're needed. Cupboards are old news when it comes to clever storage solutions – deep drawers are becoming increasingly popular in contemporary kitchens. Rather than stretch and struggle to reach the back of the unit, deep drawers will slide the back of the unit out to you! This brilliant combination of form and function lends itself perfectly to stacking crockery, and reduces the likelihood of broken plates from clumsy lifting. If you've got the perfect set of pans, or a spatula that's to die for, then why hide them away in a cupboard or drawer? Don't overlook the option of turning your cookware, spices or even dish drainers into a decorative feature by installing some stylish wall-hung racks and pegs. As we've gotten better at recycling, the need for one big bin has gradually reduced, meaning that hulking waste receptacles can be swapped for more hygienic and efficient sorting solutions. Hide away boxes for your glass, plastic and cans – as well as the household rubbish that can't be reused – will minimize the effort you've got to put in to being a friend of the environment.